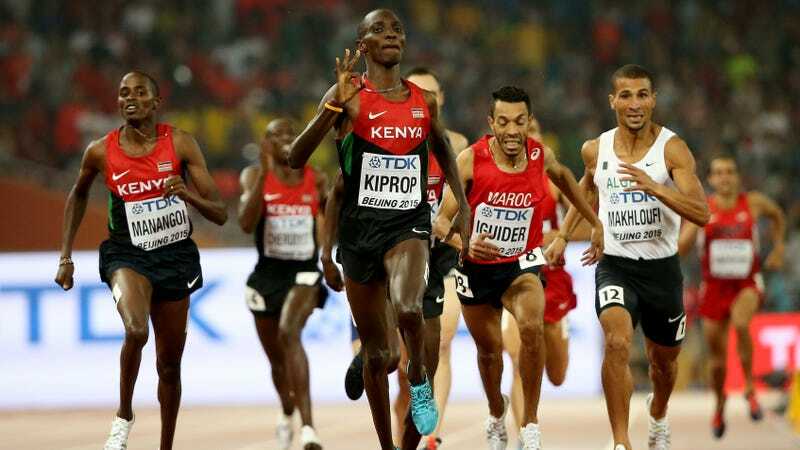 Asbel Kiprop, the best miler of the last decade, a three-time 1,500-meter world champion, and an Olympic gold medalist, reportedly tested positive for the blood-boosting drug EPO. Matt Lawton of the Daily Mail broke the story yesterday; several other outlets independently confirmed the report; and Kiprop released a statement through his lawyer today. One of Kiprop’s agents, Federico Rosa, confirmed to Deadspin that the statement was real. Like nearly every athlete who fails a drug test, Kiprop has a bizarre and convoluted story defending himself. However, this one appears to contain at least one grain of truth in it. According to Kenyan journalist Saddique Shaban, track’s international governing body has admitted it’s true that Kiprop was informed of the drug test a day early (something that is not supposed to happen) and that he paid the doping control officer who collected the test (definitely not something that is supposed to happen). The IAAF has yet to comment on another interesting allegation made by Kiprop: that they asked him to be an anti-drug spokesman and admit he doped. Distance Runner Pisses Hot is not the most shocking story, particularly when that runner is managed by the Rosas. Father and son Gabriele and Federico Rosa of Italy had been the agents for 2016 Olympic marathon gold medalist Jemima Sumgong and two-time Boston Marathon champion Rita Jeptoo when those women tested positive for EPO in recent years. (The Rosas also managed legendary Kenyan champions Paul Tergat and Sammy Wanjiru.) Federico faced criminal charges in Kenya for doping, but the charges were dropped in 2016. Whatever happens to Kiprop, this is nothing new for middle distance running. He earned the Olympic gold medal from 2008 only after the winner of that race, Rashid Ramzi, tested positive.